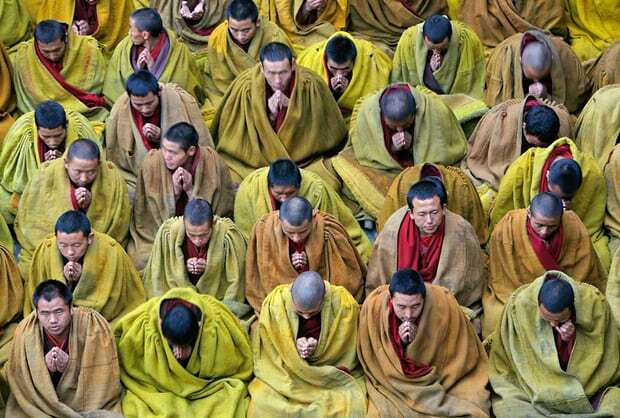 (TibetanReview.net, Mar28’19) – China says more than 30,000 Buddhist monks and nuns in Tibet Autonomous Region had been tested on Mar 25 for their knowledge on laws and regulations, with ostensible aim to improve their legal awareness and consciousness. Shorn of the propaganda euphemism, however, the Buddhist community was examined for its loyalty and patriotism towards the Communist Party of China and the Chinese state run by its dictates. It was the second time for the region to hold such a test; the first being held in Mar 2018, reported China’s official globaltimes.cn Mar 26. The subjects of the test covered the Constitution, National Security Law, Anti-terrorism Law, Anti-espionage Act, Cyber Security Law as well as regulations related to religious affairs, the report said, citing the justice department of the regional government. The report quoted the department as saying the test reinforced the notion that “national laws are superior to religious regulations, and abiding by the law comes ahead of adhering to religious discipline”. The report said the exam, administered in Tibetan language, comprised a written test and an oral exam. It was explained, however, that written test was designed for people who could write while oral exam was for those who could not. It was not clear how monks and nuns remain illiterate of their own language in monasteries, which are supposedly centres of learning. All the religious administrative personnel in the region especially had to take the exam, a management staff from the Sera Monastery in Lhasa was cited as saying. The report said about 98 per cent of religious personnel in the Sera Monastery had passed the exam. There was no information on the fate of the two per cent or so who failed in that monastery, including whether they were arrested. The report said the region, which makes up about half of the Tibetan territory under the rule of the People’s Republic of China, had a total of 1,787 religious sites with more than 46,000 monks and nuns.